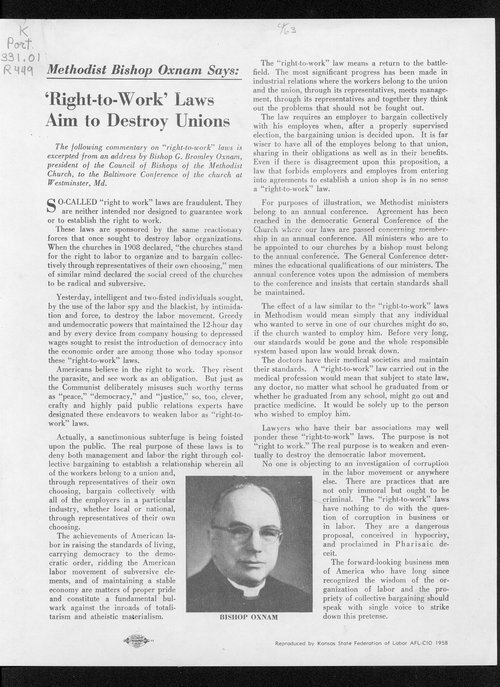 This commentary, excerpted from an address by Bishop G. Bromley Oxnam, was reproduced by the Kansas State Federation of Labor in 1958. It provides an opposing view to "right to work" legislation. In this article, Bishop Oxnam states "right to work" laws are fraudulent. They are neither intended nor designed to guarantee work or to establish the right to work. The "Right to Work" Amendment was ratified in Kansas in 1958.